Nestled snugly between Senran Kagura's bountiful bosoms and the Cold Steel of the latest Legend of Heroes chapter, Return to PopoloCrois: A Story of Seasons Fairytale occupied a relatively unassuming spot at XSEED's E3 booth last month, but it certainly left quite an impression. This upcoming 3DS title is a crossover that combines the world of PopoloCrois - a popular fantasy manga series by Tamori Yousuke that's spawned anime adaptations and a half-dozen RPGs on Playstation platforms - with the farming fun of Story of Seasons, XSEED's recent rebranding of the long-running Bokujō Monogatari/Harvest Moon series. We were able to play through an early English build while speaking with the project's localization lead, Tom Lipschultz, who's something of a PopoloCrois superfan. In fact, if you've had any previous encounters with the series, Tom might be the man to thank; before the 2005 PSP game, his fansubs for the anime were some of the only pieces of PopoloCrois media available in English. Localizing this latest crossover is definitely a labour of love, then, and after spending the better part of an hour playing, we can definitely see why; Return to PopoloCrois is shaping up to be a tremendously charming synthesis of crop-raising and classic RPG gameplay, and a real treat for fans of either. 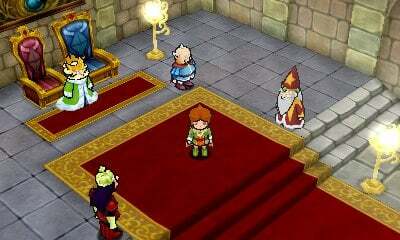 Return to PopoloCrois kicks off during series protagonist Prince Pietro's 13th birthday party. One guest, Marmela, has come for more than royal cake - her homeland of Galariland is dealing with an invasion of soil-scorching creatures that have effectively stopped any crops from growing, and things are looking accordingly grim. With seeds of a similar-seeming problem popping up in PopoploCrois as well, Pietro decides to head to Galariland to see the damage for himself and come up with a plan to save his kingdom. Once he gets there, however, he finds himself stuck with no way to return home, and so sets to reviving the land, getting his hands dirty - literally - through small-scale farming and old-school adventuring in equal measure. Right off the bat, what struck us about Return to Popolocrois was how incredibly appealing the world was. 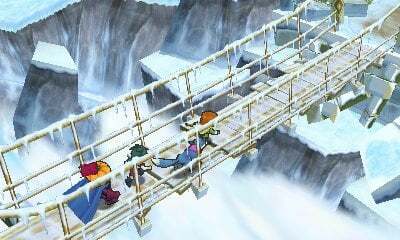 We wandered over verdant fields of waving grass, ran past rushing rivers, and tiptoed over snow-covered bridges into chilly northern towns, with everything rendered in a colourful, cel-shaded storybook style that reminded us of Ni No Kuni and Fantasy Life. It was lovely, and we happily spent nearly a half hour just exploring the overworld and taking in the scenery. The pastoral theme extended into the game design as well - as part of Pietro's fact-finding expedition to Galariland, he and his friends will shrink down to miniature size to investigate the literal root of the problem, and the first "dungeon" we foraged through was actually the stem of a small plant, with shoots and leaves acting as branching paths, and enormous blades of grass watching over us in the background. A classic RPG at heart, Return to PopoloCrois' battles are turn-based, with hints of SRPG-style positioning tactics. It's grid-based, but on such a fine-grained scale that it felt refreshingly unrestrictive - on a character's turn, you'll move them around freely within range using the Circle Pad, and then choose an action from there. You can attack, of course, but you can also use skills, team skills, or songs, which serve up particularly powerful musical magic. The battles we fought were fast and fun - we loved the animations (especially for team skills!) and the analogue feel of the positioning; it was simple and immediately intuitive, and reminded us more of a turn-based Tales game than Persona or Final Fantasy Tactics. One of our party members was also a wolf, which added a fun twist - while he controlled identically to the human heroes, we couldn't help but smile each time he barked his way into the fray. Of course, 'PopoloCrois' only makes up half of the game's title, and we took some time to get a feel for the 'Story of Seasons' side of the equation between battles. Rather than sticking to a single ranch, Pietro and his party will find several different plots of land to farm along their journey, and can visit them to raise crops for quests, cash, and quiet satisfaction. What we played of the farming felt like old-school Harvest Moon - think Harvest Moon 64, Back to Nature, or Friends of Mineral Town - and should be a relaxing counterpart to the main adventure. The shoulder buttons swapped between tools, and pressing 'A' hoed, tilled, picked or planted, depending on what we were holding at the time. As we entered the fields, the viewpoint even switched from isometric to straight-on to facilitate farming - a subtle touch that shows the care taken in integrating the Story of Seasons side into the PopoloCrois universe. And while we didn't get to try them out in the E3 build, Tom told us that bug-catching, gem mining, and animal husbandry will all factor into the final agricultural experience as well. Even with as many animals and crops as one could imagine, it wouldn't be a Bokujō crossover without romance, and happily there's a relationship system in place in Return to Popolocrois as well. Out of respect for PopoloCrois' OTP of Pietro x Narcia, however, it's actually a 'friendship relationship system', so the bonds Pietro forms with local lasses will be strictly platonic. It won't end with a blue feather and a walk down the aisle, but you'll still court your friends in the same way as classic Bokujō Monogatari or Harvest Moon games: through gift giving, conversation and interaction. From the battles and aesthetic to the farming and flirting, Return to PopoloCrois evoked memories of golden-era RPGs at every turn, but we also saw plenty of modern conveniences and features that feel designed to respect your time. You can fast-travel around the world map using fairy dust, for example, and a hint system will steer you in the right direction if you're ever lost - very helpful for a portable RPG. The dialogue was snappy and succinct, too - every NPC we spoke to had something cute or clever to say that still fit snuggly in a text bubble or two - and Tom promised that characters wouldn't ever fall into the trap of knowing less than you do to drag out story reveals, which sounds like a very good thing to us. XSEED has a history of top-notch localizations, and with PopoloCrois such a passion project for Tom and his team, we're fully expecting great things from the finished script. 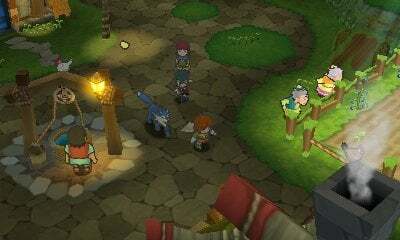 Return to PopoloCrois: A Story of Seasons Fairytale was a wonderful E3 surprise; we went into our playtime clueless and curious, and left absolutely charmed. Fans of classic RPGs, the Bokujō Monogatari/Harvest Moon series, or both should definitely keep an eye on this adventure ahead of its Winter release in North America - from our relatively short hands-on, it felt like something truly special, and we can't wait to pick up Pietro's quest again in the final version. This game looks so cute and fun. I am going to definitely get this one. I want this so much... Has it been confirmed for Europe? @HandheldGuru97 This is not the same series, Story of Seasons is only the name used for Bokujō Monogatari outside of Japan. Getting really hyped after reading this. Too bad we'll probably have to wait a long time for a release in EU. The little jewel eyes on the characters kind of creep me out. They look better in-game, though. I hear this is more like a traditional rpg with a little farming sprinkled in, but I'm still quite interested. XSEED are awesome and I love that this looks similar to Fantasy Life with farming(!) I will definitely look into this. Will keep my eyes on this one. I have enough games preordered but maybe at Christmas. Wait rpg with farming? Isn't that rune factory? @Mona-Reggie this is a different one. It's a crossover. Rune Factory is more of a spinoff, also, it's not exactly an rpg, and the farming is more central to the experience. Cant wait for this! Im hoping it has online play like Fantasy Life. It looks absolutely wonderful. Hope we don't have to wait to long. I'm on the fence about this one. I'll wait and see. Fantasy Life? Ni No Kuni? And farming! Where do I sign up??? Sounds like it won't be soon, so I'll have time to play all the old Harvest Moons (which I never finished not even one of). Any more suggestions of games to play to get ready? 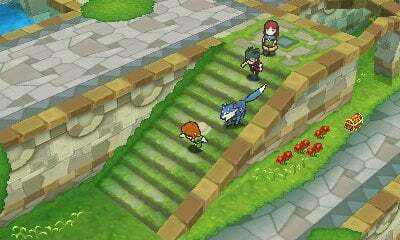 I've played Fantasy Life and Ni No Kuni to the ends, but this game looks really worth it as well. What a concept. You go around saving the world, but take time out to farm! Never been so interested in something I never knew about until XSEED's announcement. Definitely going to be picking this up day one, love everything about it. @Thulfram I recommend taking a look at the Rune Factory series of games (particularly Rune Factory 4 the newest entry), as well as Dragon Quest. Sounds incredible, consider me hooked! I love Fantasy Life and Harvest Moon/Rune Factory, so this is right up my alley. Hopefully it'll be released in Europe as well. I take it the words "Story of Seasons" will be shoved in everywhere "Harvest Moon" used to be now? @-Godot Yeah, because Story of Seasons is what HM used to be. It's the new localized name of the same Japanese series (Bokujō Monogatari). This keeps looking better and better! I've always loved Harvest Moon games and turn-based RPGs, so this should be right up my alley. Also comparing the battle-system to a turn-based Tales system has me all sorts of excited! The games looks fun and light heart-ed. Overall it seems like very well done, and the game incorporates a lot of stuff in it. I've been anticipating this since it was announced. I loved Popolocrois since the PSP localization here in the west but I'm still a little sad that the other games were never really released here. I've done many playthoughs with my UMD copy and let me tell you my PSP doesn't love me when I play it.